This is a post about my father, Ralph Bulmer, a man literally larger than life. Ralph died more than a quarter of a century ago, at the age of 60. My half-brother Richard, who was only four, has no memories of our father. So, Rich, this is for you. And for the grandchildren that Ralph never saw. Ralph was a Cambridge-trained social anthropologist, naturalist and ethnobiologist who worked in the New Guinea highlands from 1954. He was both a leader in his field and an original, radical thinker who walked his talk, breaking down the distinction between subject and researcher. Only a handful of anthropologists, even to this day, have ever gone as far as co-authoring books with the indigenous people they were studying. 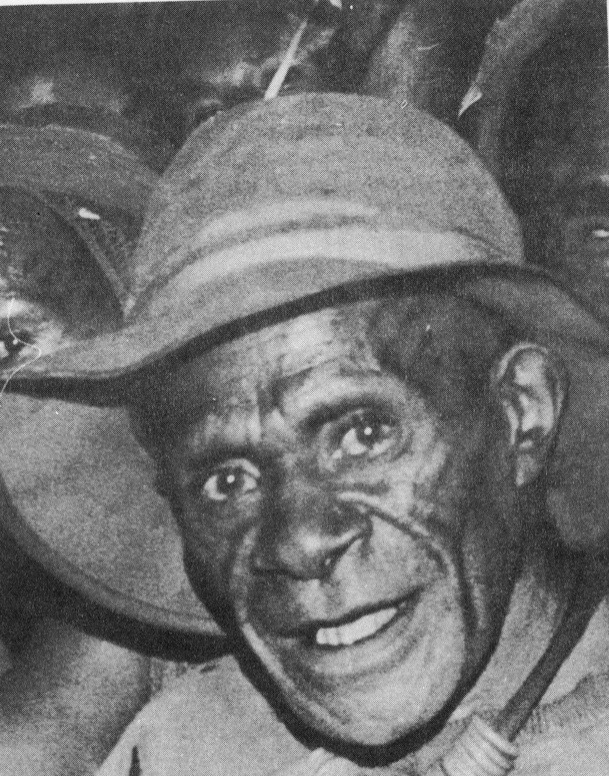 Ralph Bulmer in New Guinea in the mid-1950s. Ralph was married three times: firstly to Ellaine Bruce, who he met and married when they were students at Cambridge. In 1959 he married my mother, Susan Hirsh. And in 1983 he married Lena Lane. Ralph had four children: I was born in 1961, David in 1962 and Kenneth in 1964. Richard was born in 1984. Ralph was a man of many parts, and he meant different things to different people. Man and a Half, the monster-sized festschrift edited in his honour, by his student, friend and colleague Andy Pawley, contains reminiscences from a range of people in Ralph’s life. But this is my version of the story. I saw Fantastic Beasts and Where to Find Them a few days ago. It reminded me of my father – because that was his world. Newt Scamander is partly an homage to English naturalists and explorers, going back through David Attenborough to Charles Darwin and many others. My dad was a big fan of Gerald Durrell, who collected fantastic beasts from around the world, and wrote best-selling books about his experiences – A Zoo In My Luggage, etc. My Family and Other Animals is my favourite. British naturalists of my dad’s world were fascinated by nature in general, and the world around them. Being a naturalist could be a vocation, but it wasn’t something you had to go to university to study. There are three things that most people noticed about Ralph. Firstly, his size: he was six foot six and a half inches in his bare feet, and 18 stone. Secondly, his unusual name. Ralph is pronounced “Rafe” in the middle-class English manner. (Ralph Fiennes, Ralph Vaughan Williams, etc.) My mother’s Californian whanau could never get their heads around this. Thirdly, his charisma. Ralph was an incredibly charming man. “He could charm the birds out of the trees,” as one family friend said. When he turned his attention on you, you felt that you were the centre of the universe. Ralph could easily hold the attention of a lecture theatre full of students. As a young child I found it problematic to have a father like this. It was wonderful when I had his attention – but when he turned it elsewhere, it felt like I was suddenly alone in the dark. 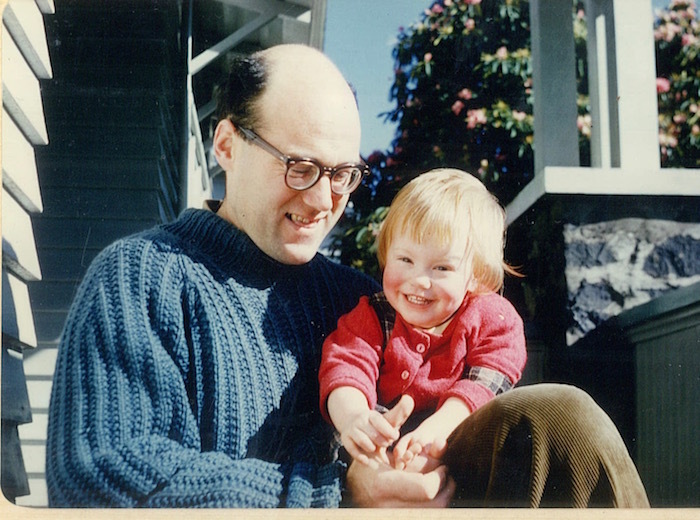 Me, aged about one, with my wonderful Daddy. The fourth thing about my dad, which I didn’t realise for many years, is that he was a “chick magnet”. He had women throwing themselves at him, and a lot of the time he didn’t put up much resistance. He wasn’t conventionally handsome – but he was a “big bear of a man”, and he was charming. Ralph looked and played the part of an eccentric professor: bald head, glasses, goatee…. Once when I was with him, a little girl came up to us and exclaimed, “You look like a Hollywood professor!” Dad just laughed. Ralph Neville Hermon Bulmer was born in Hereford in 1928. He was the oldest of three children: Rosemary was three years younger and John was ten years younger. His father, Kenneth, worked for the National Westminster Bank, a job that he hated. Kenneth was interested in nature and fishing, and he passed on his love of nature to Ralph. 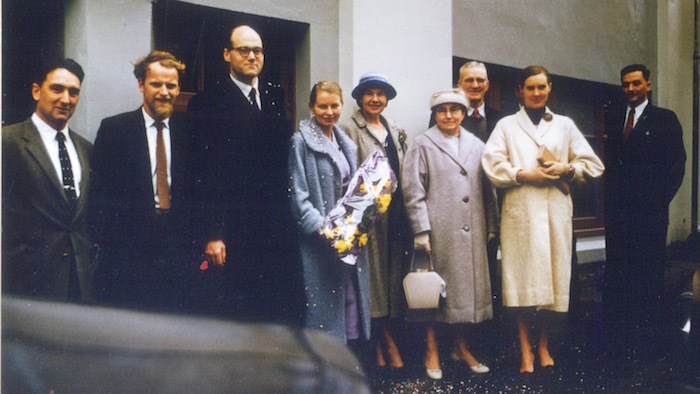 Ralph’s mother, Dorothy, was the only child of Harold and Charlotte Hughes of Bangor. Harold was an archaeologist/ architect who was involved in restoring several of the medieval castles of Wales. Kenneth’s parents lived in Holyhead. His father, Julian, had been a seafarer who captained the mailboat between Holyhead and Dublin. Dorothy was several years older than Kenneth. Many of the men of her generation had died in the first World War, and she considered herself lucky to find a husband. However, the class difference caused stress in their marriage. Dorothy had never learned to cook or do housework before she married. Christ’s Hospital students wore a distinctive Tudor-style uniform with blue coat and yellow socks. My mother, Sue, said to me that she thought that because he’d been at boarding school Ralph simply had no experience of normal family life, and this affected his behaviour and attitude in our family home. My stepmother Lena has said that Ralph described boarding school as a time of huge deprivation. The only woman the boys saw for months at a time was the school nurse. Another deprivation Ralph experienced at boarding school was food. His time at Christ’s Hospital coincided with British wartime food shortages and rationing. At the age of 11 he was already tall. It was too late for his growth to be stunted by lack of food. He was a starved six-foot teenager. I’ve seen some of Ralph’s reports from Christ’s Hospital and he kept a pretty low profile (for someone so tall). His academic results were okay, but not spectacular. He specialised in languages (French, German, Latin), which was normal for academically able students. (Less capable students did science.) Ralph hated cricket and chose to work in the school garden instead of playing. However his size meant he was a hugely valuable lock for the school rugby team (at 16 he lost a couple of front teeth in a tackle). In his last year of school, just as the war ended, Ralph surprised his headmaster by winning a scholarship to Clare College, Cambridge. Before he could start university, Ralph had to do two and a half years of military service. He was in the British Army education corps in Germany straight after the war. Lena says Ralph talked to her about what a shocking and traumatic place it was, where people were so desperate and demoralised that they would sell their body for a meal. The other thing that happened to Ralph in the army was that at the age of 20, without doing anything to deserve it, he was suddenly promoted to captain. His commanding officer said, “It’s good to see some mature chaps around here.” Ralph was over six foot six and already balding, so people tended to assume he was much older than he was. He threw himself into Cambridge life with gusto. There was a lot of hanging out in cafes, and holding whimsical parties. In Ralph’s third year he did something unusual – he got married, to Ellaine Bruce, a fellow undergraduate. Ellaine was thrown out of her college for this, and her family were furious with both Ellaine and Ralph. During his undergraduate years, Ralph also went on two trips to study the Lapps/ Sami, the indigenous people of northern Scandinavia. One of his Cambridge tutors was Dr Etheljohn Lindgren, a six-foot Swedish anthropologist (and probably also a spy). She was married to Mikel Utsi, a diminutive Lapp reindeer herder. Both Dr Lindgren and Mr Utsi were mentors for Ralph. I remember visiting them in Cambridge in 1973. Mr Utsi had a huge reindeer-skin Sami tent (rather like a tipi) erected in their suburban back garden. After graduating from Cambridge, Ralph applied for a postgraduate scholarship to study Bushmen in southern Africa. However, he ignored advice to shave off his goatee beard before catching the train to London for the interview. As soon as he walked into the room he realised his mistake. The meeting chair was a prominent anthropologist who also had a bald head, horn-rimmed glasses and a goatee. This eminent intellectual almost certainly thought the young upstart was making fun of him by aping his style. Needless to say Ralph didn’t get that scholarship. (In future when he was seeking research grants and/or jobs, Ralph was always careful to shave off his beard.) The next opportunity was a scholarship to do a PhD at the Australian National University, and to do research in New Guinea. So, in 1953 Ralph and Ellaine went off to the Antipodes. 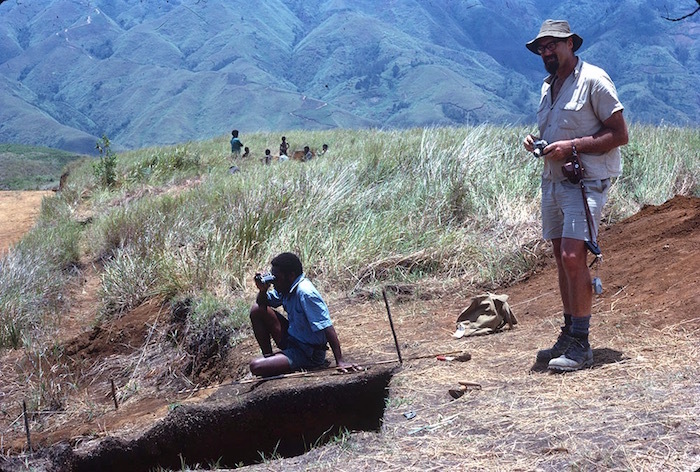 Ralph’s first New Guinea fieldtrip was to a place called Baiyer River, near Mt Hagen in the Western Highlands district. He did the fieldwork here that formed the basis of his PhD thesis on the leadership structures of the Kyaka Enga. Ralph’s mentor in the Baiyer River was a local leader and sorcerer called Ligi (pronounced “Linky”). I’ve often wondered if Ralph was aware of the paradox of writing a thesis on leadership based on structural-functionalist kinship theory, when the parallel power structure of sorcery and magic was sitting right next to him. 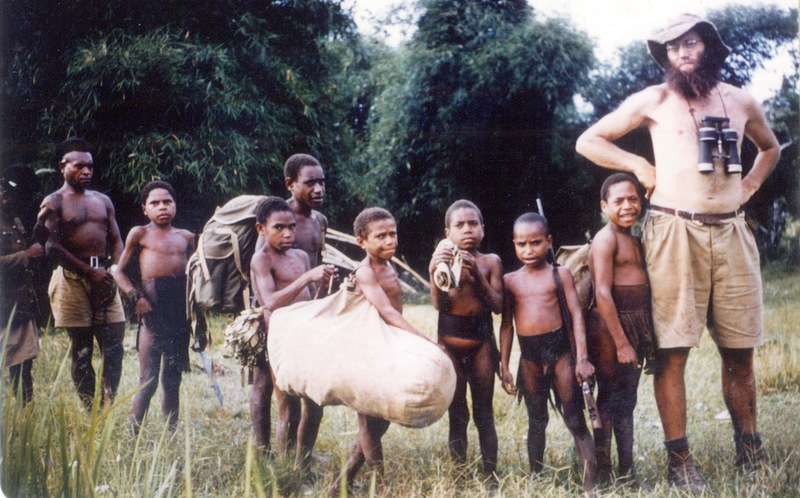 Ralph with Kyaka Enga people, 1955. Photograph by Ellaine Mabbutt. Ellaine went with Ralph to New Guinea. But I think it was uncomfortable and hugely boring for her. She wasn’t an anthropologist herself. I doubt if anything could have helped her prepare for the role of being the wife of an anthropologist in the New Guinea highlands in 1954. After some months they went back to Australia on leave. Ellaine stayed behind when Ralph returned to New Guinea to continue his research. My impression (based on first-hand observation) is that anthropology was very hard on marriages. My mother, Sue, said that Ralph was never very happy about having his wife and family in the field with him. It cramped his style. But this meant he was away for long stretches of my childhood. When my parents were both working in the Kaironk Valley in 1973 they lived in separate houses half an hour’s walk apart. One eminent anthropologist I know of was divorced by his wife when she discovered that he had two completely separate families: one in New Guinea and one in Britain. Ralph didn’t do this. But his style of research meant he preferred to be on his own in the field, without his family (although he was happy to have colleagues with him). In 1956, while Ralph was in New Guinea, Ellaine became pregnant to a geography lecturer called Jack Mabbutt. Ralph was devastated. His first response was to return to Cambridge. ANU was a small community and he didn’t want to stay in Australia while Ellaine had her baby. He had a temporary tutoring position at Cambridge in 1957. But it was made clear to him that he couldn’t remain there – he wasn’t in favour with the head of anthropology at the time. One of Ralph’s friends from Cambridge, archaeologist Jack Golson, had recently taken a job at the University of Auckland, and he suggested that Ralph apply for a job there. Ralph turned his considerable British charm on Sue, and she eventually succumbed against her better judgement. She made a Faustian pact. “Okay, I’ll marry you if you take me to New Guinea.” It was the opposite of Ellaine: here was a woman who actually wanted to go to New Guinea! Ralph and Sue were married in July 1959, shortly after Ralph’s divorce from Ellaine had been finalised. A few weeks later the newly-weds were in the New Guinea highlands. Ralph and Sue on their wedding day, July 1959: bags packed and ready to go to New Guinea. They initially spent several weeks together in the Baiyer River area, and then Ralph went off with his colleague, the New Zealand linguist Bruce Biggs, to make his first visit to the even more remote Kaironk Valley, in the Schrader Ranges. Sue carried out excavations and site surveys on her own for five months, in various parts of the highlands. I’ve told this story elsewhere from Sue’s point of view. I think Ralph learned from this experience, even though he may not have acknowledged this to Sue. When Birds of My Kalam Country was published in 1977, Ralph was careful to put Ian Saem Majnep’s name first as co-author. While Sue was carrying out the first archaeological excavations in the New Guinea highlands, Ralph was losing his heart to the Kaironk Valley and the Kalam people. In this beautiful, remote valley he found a culture of people whose interest in and understanding of the natural world he could relate to and learn from. The Kalam were highly skilled horticulturists and hunters who had only recently been in the Stone Age. Ralph’s friend and mentor Wpc (Oovitch). Ralph also made lasting friendships with younger Kalam. John Kiyas and Simon Peter Gi came to stay with us in Auckland in 1967, when they were in their late teens. In the early 1960s Ralph also met Ian Saem Majnep, a Kalam youth who had remarkable knowledge of natural history of the Kalam region. Saem became Ralph’s research collaborator and they went on to co-author Birds of My Kalam Country. Saem was also a valued colleague for Sue, working on her excavations for several years and in her laboratory at the University of Papua and New Guinea. In 1989 Saem was awarded an honorary doctorate by the University of Papua and New Guinea. 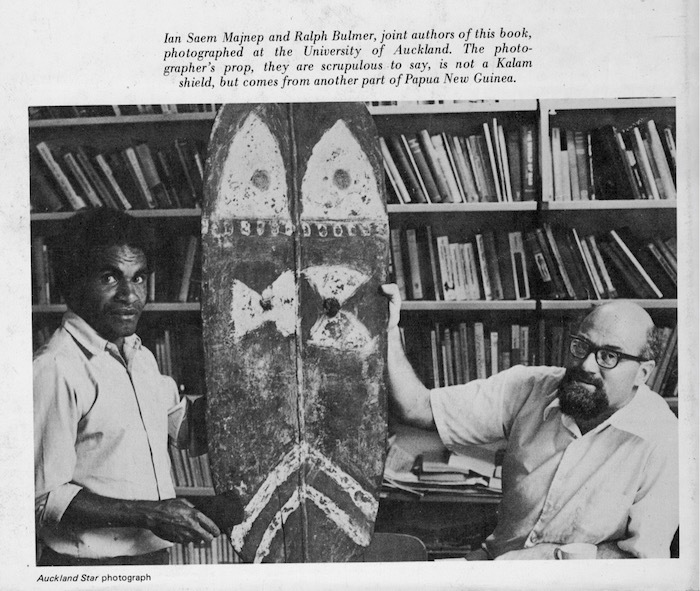 Ralph with Saem Majnep, his research collaborator and co-author, in 1977. From this stage onwards, Ralph’s research focus was on ethnoscience – how a traditional culture perceives and uses the natural world. He was passionately interested in the animals and birds and plants of the New Guinea highlands. When he was on fieldwork there was always a steady stream of youths and small boys turning up with birds and animals of all shapes and sizes, dead and alive, for Ralph to examine and identify. It wasn’t just the spectacular birds of paradise and cassowaries – Ralph was interested in everything from worms on up. Ralph moved quickly up the academic ladder, becoming professor and head of the Department of Anthropology and Sociology at the University of Papua New Guinea at the age of 39. He was a conscientious and thoughtful head of department, but administration didn’t come easily to him. I think Ralph was actually a rebel, who found himself in authority positions, without really asking for them. He was tall, white, male, middle-class, British and educated at Cambridge – all the prerequisites for leadership in the post-British Empire. There was also good timing – Ralph was riding the wave of popularity of anthropology in the 1960s and 70s. And, in Sue he had an ambitious, capable wife who put considerable energy into making sure her husband did what was necessary to get promoted. She told me she typed the final draft of his PhD thesis in 1960 (ironically, Sue probably put time and energy into Ralph’s thesis that she should have put into getting her own Master’s thesis completed, before babies started arriving). “He didn’t have any ambition, he might not have finished it otherwise,” she said. In those days it wasn’t necessary to have a PhD to get a job as a university lecturer. But having the doctorate definitely paved the way for Ralph to become a professor. Ralph found people management very stressful. His charisma, that was so effective in lecture theatres and one-to-one, was not as useful when dealing with university committees and departments full of difficult and eccentric academics. And he hated being regarded as a colonialist authority figure. Some of Ralph’s colleagues were so busy resenting him for being a boss that they didn’t recognise the radical nature of his work. I think the stress of the leadership roles definitely hampered Ralph’s research outputs and shortened his life. (Although heavy smoking was a factor as well.) I remember him having chronic backaches and also what was probably undiagnosed depression. Ralph’s physical size may have brought him some advantages in the world, but it also caused him many problems. Like Hagrid in the Harry Potter books, he was “simply too big to be allowed”. At six foot 7 (over 2m), he regularly bumped his head on door frames. He couldn’t squeeze into small Japanese cars – he drove a large Peugeot station wagon, followed by a huge Volvo, that could accommodate his size. On planes we always had to sit in bulkhead seats because dad’s long legs wouldn’t fit in the rows. He couldn’t easily buy clothes and shoes that fitted him anywhere except Tonga. Sue used to sew his shirts. And my parents never had a normal sized bed. Ralph’s weight would fluctuate considerably. When he was away on fieldwork in the New Guinea highlands he would become fit and lean, with the exercise and healthy “paleo” eating. But at home in the city he would pile on weight – at his heaviest he was well over 18 stone (115kg). Which for someone of his height was actually not way out of proportion – but it was still unfeasibly huge. Ralph in “fit and lean” mode, at Sue’s excavation, Wanlek, in the Kaironk, 1973. As children we only got to see glimpses of our father. He was away in New Guinea for long stretches of my early childhood. Even when he wasn’t away on fieldwork, he spent very little time at home, and when he did he was often grumpy and stressed (which was probably not unusual for men of his era). When we were living in Papua New Guinea, he would cook us bacon and eggs on Saturday mornings and then take us to the beach, to “give our mother some peace and quiet”. Quite often we would be joined there by one of Dad’s female colleagues. I never put two and two together until many years later. Ralph was a very social man, who kept up friendships with people all over the world – including his first wife. Ralph and Ellaine remained very fond of each other, to the intense jealousy and irritation of their spouses. Ralph left money to Ellaine in his Will, even though he really didn’t have anything to leave. When I was nine I travelled with Ralph to England to visit my grandmother and other family. It was a wonderful time. I loved having my father’s attention for long stretches. He was a charming and entertaining companion. The only downside was that we always had to sit in the smoking compartment on trains. Dad was a heavy smoker. Ralph loved giving generous and thoughtful gifts (in contrast to my mother, who hated shopping). I still have a silver necklace that he gave me for my birthday when I was 16. When I was 18 and leaving home to go to university, Dad gave me a beautiful red electric kettle and matching teapot. Dad’s study was crammed with books and magazines. I never had to go to the library – whenever I ran out of reading material I’d go and ask him for suggestions. One memorable day he handed me Nancy Mitford’s The Pursuit of Love – a family crazier than my own! He had a great whimsical English sense of humour and introduced me to Beachcomber, Ronald Searle’s Down With Skool, Edward Lear and Old Possum’s Book of Practical Cats. I think this is one of the things he shared with Ellaine. My mother didn’t come from that cultural space at all. Ralph had been a far better cook than Sue before they married, but quickly reverted to expecting his wife to produce meals for him. However, when we were away on fieldwork in the Kaironk Valley Ralph and Sue would take turns cooking over the open fire. I loved Ralph’s camp cuisine, even the weird-flavoured New Guinea highlands greens. Ralph’s experience of hunger in his schooldays meant that he liked substantial meals, always ending with pudding. When Sue started refusing to cook sweet desserts for health reasons (she was concerned about Ralph’s weight as well as her own) this created considerable marital disharmony. Ralph left a lot of his life’s work unfinished with his early death, including a four-year-old son, my half-brother, Richard. But he was truly fortunate in his choice of literary executor. For more than two decades after Ralph died, his colleague and friend, the Australian linguist Andrew Pawley, continued working away at the uncompleted manuscripts, with Ralph’s co-author, Ian Saem Majnep. Kalam Hunting Traditions (bilingual text in Kalam and English) was published in 1991, and Animals the Ancestors Hunted in 2007, both co-authored by Saem and Ralph. A Dictionary of Kalam, with ethnographic notes, co-authored by Andrew Pawley and Ralph, was published in 2011. A further ethnoscience manuscript, Kalam Plant Lore, remains incomplete, since Saem’s death in 2007. Ralph is buried on the shore of the Manukau Harbour, a place he chose when he knew he was dying. There are scores of birds to watch, fishing in the mangroves. But I’ve always been pretty sure that my dad isn’t there. He’s in his happy place – the Kaironk Valley. “Why is the Cassowary Not a Bird? A Problem of Zoological Taxonomy Among the Karam of the New Guinea Highlands.” By Ralph Bulmer, Man Vol 2 No 1, 1967, pp. 5-25. Birds of My Kalam Country by Ian Saem Majnep and Ralph Bulmer. 1977, Auckland University Press. Kalam Hunting Traditions by Ian Saem Majnep and Ralph Bulmer, Andrew Pawley (ed.) 1991, Working papers in Anthropology, Archaeology, Linguistics, Maori Studies Nos 85-90, Department of Anthropology, University of Auckland. Animals the Ancestors Hunted by Ian Saem Majnep and Ralph Bulmer, Robin Hide and Andrew Pawley (eds.) 2007, Crawford House Australia, Adelaide. A Dictionary of Kalam, with ethnographic notes by Andrew Pawley and Ralph Bulmer, with the assistance of John Kias, Simon Peter Gi and Ian Saem Majnep. 2011, Pacific Linguistics, Canberra. 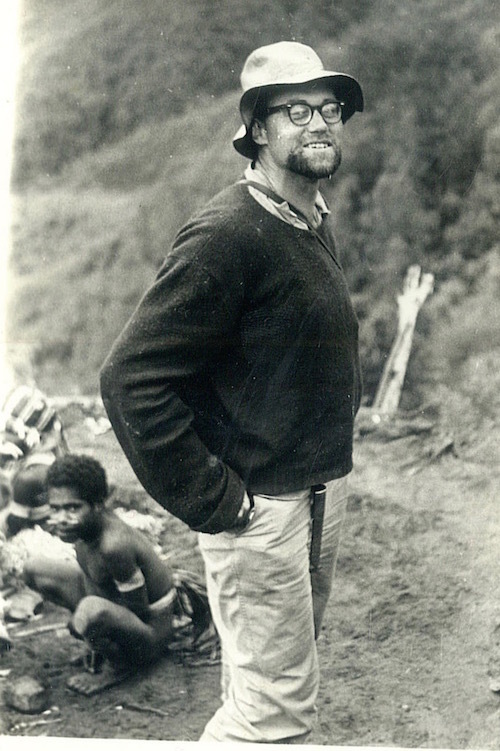 Man and a half: Essays in Pacific Anthropology and Ethnobiology in honour of Ralph Bulmer. Andrew Pawley (ed.) 1991, The Polynesian Society, Auckland.